Doors will be opened 60 minutes before the curtain time. ♦ The performance on 14 December has been rescheduled on 13 December. ♦ TV camera will be in the theatre for the recording of performance by NHK on Thursday, 6 December. Available from Sunday, 9 September 2001 at 10:00 am. Verdi's Masterpiece in his prestigious period is coming up at the end of Verdi Year 2001. Although the Spanish prince, Don Carlo had been engaged to the French princess, Elizabetta, she had to get married to Don Carlo's father, Filippo II as a political marriage. Don Carlo is in deep grief... And the tragedy starts. Don Carlo can be called one of Verdi's masterpieces for deeply moving audiences. 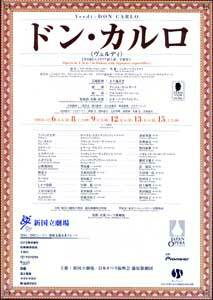 This time, the New National Theatre, Tokyo presents the four-act version in Italian that first premiered in Milan in 1884. Psychological complexity of human beings is fully staged with profound music and dramatic expression of the tragedy, which includes political and religious conflicts, and each thoughts of Don Carlo, the King and his consort, Princess Eboli, and others - jealousy, doubt, love and hate, and the friendship between Don Carlo and Rodrigo. NNTT presents the original production of a master, Luchino Visconti to be revived by Alberto Fassini.